Siargao is quickly becoming a popular destination, thanks to its beautiful and private beaches, and the endless amount of exciting attractions and activities it offers. Now is the best time to visit the island, before its gets too popular and tours become crowded. All of our Siargao day tours include hotel pickup / drop off with a van, complimentary lunch, all fees and a licensed tour guide. Our guide will accompany throughout the whole tour and make sure you are safe and have a great time. Island hopping and boat tours also include all necessary snorkeling gear and a life vest. Browse below for a complete catalog of the tours we offer in Siargao or contact us now and we’ll help you pick the best things to do during your stay. All of these activities can be easily incorporated into your complete Siargao tour package – which will also include airfare and accommodation. Our tours are all available both as private tours and shared. If you join a group, prices can drop significantly, but you will have to share the boat with 8 other people. These tours are all done with a bangka, a traditional Filipino outrigger canoe. Taking a private speedboat is also possible for an added cost, please contact us directly for a quote. Sometimes shared tours will not go out unless there are at least 5 or 6 people on the boat. If you’d still want to go anyway, you might need to pay more. This rarely happens nowadays since Siargao is so popular and tours are in high demand, but it’s something you should be aware of. We will update you on the situation immediately and help you decide which attraction to book instead. Prefect for : Couples, Nature lovers, Adventure seekers. Best time to visit : March to November. Tour packages include : Hotel Pickup, boat, guide, lunch. Siargao started out primarily as a surfing destination and to this day the surfing scene offers the most developed and mature attractions on the island. For that reason, we strongly suggest you incorporate at least a bit of surfing into your list of activities on the island. This does not mean other tours are worth passing on, as Siargao has some of the most beautiful beaches and landmarks you’ll see anywhere in the Philippines. Tour operators might not be as professional as the ones in El Nido or Boracay, but the scenery is just as spectacular. We only work with the best tour operators on the island – people who have been there for years and know how to run these tours smoothly. Your safety and enjoyment are always our top priority, and we constantly monitor the service provided to make sure the tours we offer are the best ones available. The good thing about Siargao being a small island is that there’s plenty of room for special requests – you can basically build your own day tours if you wish to. All you have to do is contact us and let us take care of everything. Island hopping tours in Siargao are typically done with a pumpboat which can host up to 10 people. Booking the boat all for yourself is possible, but we need to check it since availability is limited. Families and groups of 5-6 people should have no problem getting a boat all for themselves, but couples will usually have to share it with at least one more couple. Most of the tours mentioned below are also available using a private speedboat. It allows for greater flexibility and it’s also much more comfortable. For that, you obviously pay more. Since the price isn’t fixed and is determined based on availability and season, we ask that you contact us directly to get a quote. We are the only travel agency in Siargao offering island hopping tours with a speedboat, and we will be happy to send you updated rates by mail. The 3 islands included in all tours are Guyam, Daku and Naked island. A visit to the nearby Fish Sanctuary is also included. These are the most beautiful islands and it would be a shame to go island hopping and skip any of these. All tours include a licensed tour guide, lifevest and snorkel gear, free lunch and all fees and extra charges. All tours take between 6 and 7 hours, with pickup from hotels being between 7:30 to 8:00 AM. You should expect to be back at your resort by 3PM. It can take a bit longer for the tours which involve going to more islands, but in any case, you will be back well before dinner. Classic island hopping tour: Go to the 3 popular islands and a bonus visit to the Fish Sanctuary as well. Price for a couple is 16 USD each, while a group of 5 pays 9 dollars only. 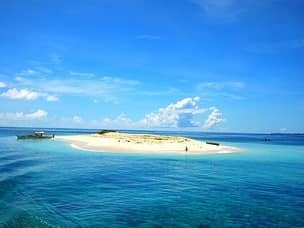 Island hopping and Land tour combined: On top of the classic island hopping tour, you’ll also visit Cloud 9 beach, Magpupungko tidal pools, Tayangban cave and Panghungawan marsh. Expect to be back at your hotel by 5-5:30 PM. Since we cover a lot of locations, you won’t have a lot of time in each. If you have time in Siargao, it might be better to split this into 2 days instead. Price for a couple is 45 USD each, and a group of 5 will pay 25$ per person. 7 Islands tour: This tour adds 4 additional islands to the classic day tour. This means you’ll have less time to spend at each island, but you get to see much more of the area. A visit to the Fish Sanctuary is also included. Price for a couple is 42$ each, while a group of 5 pays 22$ per person. No visit to Siargao is complete without at least trying out surfing once. Cloud nine beach is the top surfing spot, hailed as one of the best beaches to surf at in the whole world. On top of that, there are no less than 15 other smaller areas which are better suited for experienced surfers. While there’s no real reason to book a surfing session in advance, it does provide you with some peace of mind of knowing you have everything taken care of before you arrive. If that’s not enough, booking through us is actually cheaper than finding someone once you arrive at the beach. Lastly, we only work with the most experienced and professional instructors on the island – so you are always in good hands. Price for a surfing lesson is 400 (8 USD) pesos for an hour, or 700 (14 USD) for 2 hours. This price is per person, and you can definitely take one guide to teach an entire group. It includes all the necessary equipment as well. Surfing packages are also available at multiple resorts and surf camps around the island. They include a week of accommodation and surfing expeditions. It’s a great opportunity to join a group of young people and have a great time. Prices for these packages vary depending on season and availability, so please contact us for a quote. Sugba lagoon is a large stunning location, closely resembling the scenes of Palawan. It is by far one of the most popular and recommended things to try out while in Siargao. It’s certainly possible to rent a motorbike and go there yourself, since it’s only less than an hour away from General Luna, but the tour provides a lot of added value. Our tour to Sugba lagoon includes hotel pickup/drop-off in a modern van, a licensed tour guide, BBQ lunch, snorkel gear and all fees covered. Once at the lagoon, you can rent a kayak for 400 pesos which is roughly 8 USD. 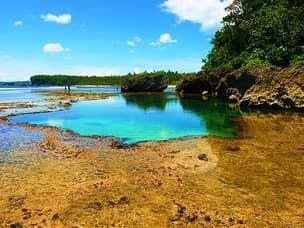 A visit to the lagoon is often combined with a stop at Magupupunko tidal pools, turning it into a wonderful day tour covering 2 of Siargao’s best attractions. The tidal pools can also be visited as part of our Siargao land tour instead. This tour includes Cloud nine beach, the tidal pools, Taktak Falls, Del Carmen Mangroves, Pacifico beach, Tayangban cave and Panghungawan marsh. Price for a couple is 50$ each, while a group of 5 would pay 25$ each. Sohoton Cove in Bucas Grande is considered one of the most beautiful places in the Philippines. Most tours going there are using a regular bangka (pumpboat) and the journey takes 2.5 hours per direction. Being so remote is a big part of why Bucas Grande is such an amazing nature destination. It’s one of a very few places where you will truly feel like you are alone at your own private paradise. We are the only travel agent in the Philippines offering this tour using a private speedboat. It cuts down travel time to 1 hour and lets you enjoy the tour so much more. It really makes a huge difference in terms of comfort. Prices for this service are flexible and based upon availability and season – so please contact us as soon as possible to receive our updated offer. The regular tour with the pumpboat includes stops at the Magkukuob, Bolitas and Hagukan caves, as well as a visit to the Tajoman jellyfish sanctuary. If time permits, you can also take a quick island hopping tour of the area. The tour includes all entrance fees and charges, life vest and snorkel gear and a complimentary BBQ lunch. Price for a couple is 55 USD each, and groups of 6 or more will pay 25$ per person. Due to the long distance, some people choose to take this tour with an overnight stay at Bucas Grande instead. It’s a great change of atmosphere if you have plenty of time in Siargao and want to get a taste of something a little bit different. Visit our Bucas Grande packages page for detailed offers for accommodation and additional activities in the area.